Apple's (AAPL) stock has stalled. Now what? Investors seem split on where Apple goes from here. The bulls, predictably aren't worried. After all, it's not uncommon for stocks to pause for breath -- and Apple rose to $364 a share in mid-February from $240 in late August, That's a rise of 51% in less than six months. But since hitting that all-time high of $364, Apple's stock has gone through a turbulent patch, falling as low as $326 a share on March 16. While the stock has rebounded somewhat, it's treading water at around $340 a share -- while investors await a signal of its future direction. Apple's outlook, though, is a complex one. Its medium-term future looks as promising as ever, but that sunny outlook is sandwiched by some near-term concerns: the effect of the Japanese earthquake on its current quarter, and longer-term uncertainty about its prospects several years from now. To invest in Apple means, more than most companies right now, deciding how long to hold the stock. Concerns over Apple's performance in the March and June quarters began to mount after the March 11 earthquake and tsunami in Japan. That disaster disrupted supply chains in many industries and, some analysts believe, could leave Apple only a two-month supply of some iPhone and iPad components. Apple could find components elsewhere, but it may end up paying a premium to keep the supply chain running smoothly. And while Apple is holding onto its share of the smartphone market, it's not stealing share away from weaker players like Research-In-Motion (RIMM), Microsoft (MSFT) and HP's Palm (HPQ). Those three companies saw their market shares decline and Android phones sold wildly. Apple's share of the smartphone market edged up slightly to 25.2% in February from 25% in November, according to ComScore. Smartphones using Google's (GOOG) Android operating software rose to 33% of the market, from 26%. Apple plans to counter with the iPhone 5 later this year, which is expected to include technology that taps faster 4G networks and be used as a digital wallet. But there's word the release date could be pushed back until the fall -- meaning most iPhone 5 sales could come in 2012. That possible delay is adding to near-term concerns. Investors will have more clarity on these fronts when Apple reports its earnings on April 20. But some are already looking beyond the next few quarters -- to an era of prosperity driven by rising sales of iPads, a growing share of the laptop market for Macbooks and the introduction of iPhones into countries like China. The China market is an especially encouraging area for Apple. China Telecom (CHA) says an online poll of 8,300 people showed 73% of respondents were interested in buying an iPhone 4 -- and that most of those surveyed found the price tag to be too high. In a note on the survey, Ticonderoga Securities says China Telecom might offer the iPhone as early as this summer. Other potential positive for Apple might not kick in until late 2011 or even 2012. The availability of iPhones on Verizon (VZ) networks could boost sales, but many Verizon subscribers may choose to wait for a 4G model before switching to the iPhone. And AT&T's (T) planned purchase of T-Mobile USA could bring Apple millions of new iPhone customers. But the deal could be held up by regulatory scrutiny as well as integration issues, which could take a few years to sort out. 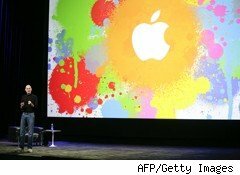 More importantly, Apple is making signs about an aggressive push further into media, building a huge computer center capable of hosting high-bandwidth content and shaping Apple TV into a more appealing consumer device. To date, the iTunes store hasn't been a major contributor to Apple earnings, serving instead as a draw to its higher-margin offerings like the iPhone and the iPad. But if Apple gets serious about media, that could change in the next few years. At the same time, the longer-term outlook is clouded not just by the diminished leadership of Steve Jobs, as I've argued in the past, but by the loss of longtime heavyweights like Bertrand Serlet, who was key to Apple's revival and its OS X software. Jonathan Ive, Apple's design guru, was recently rumored to be leaving -- which would be an even bigger loss. All were members of the team which led Apple from its malaise in the late 90s to the $312 billion market cap giant it is today. The risk is that, as more members of this core team exit the company, the competitive edge Apple has in so many markets will be that much duller. The company could lose more talent if its stock price continues to stay stalled. Apple's surging stock price isn't just a boon for investors, it's an important draw for engineers, designers and others crucial to the company's innovation and success. It's been more than three years since Google's stock has traded above $630 a share, and it's lost a lot of its top talent in the interim. In short, Apple's prospects should be bright for some time, but there may be some speed bumps ahead that investors should keep in mind along the way. Things are likely to remain choppy for a quarter or so, but Apple is poised for a few strong years beyond that. And after that? Apple will need a dramatically new plan to extend its success even further.